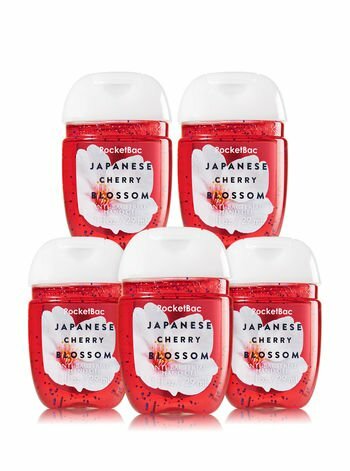 Bath & Body Works Japanese Cherry Blossom 5-Pack PocketBac Sanitizers Anti-Bacterial Hand Gel 1 Fl Oz. A graceful blend of seductive blossoms, Asian pear & sandalwood. America's #1 fragrance collection in our most powerful germ-fighters! Five of our PocketBacs feature a skin-softening formula that kills 99.9% of germs while conditioning your hands. Plus, they're perfectly shaped for pockets and purses, making it easier than ever for you to take your favorite scent on-the-go. Don't forget to add a cute holder, sold separately!. America's #1 fragrance collection in our most powerful germ-fighters! Five of our PocketBacs feature a skin-softening formula that kills 99.9% of germs while conditioning your hands. Plus, they're perfectly shaped for pockets and purses, making it easier than ever for you to take your favorite scent on-the-go. Don't forget to add a cute holder, sold separately!